Construction management is a service whereby an owner obtains the assistance of a construction expert to act as their agent in administrating the construction process. 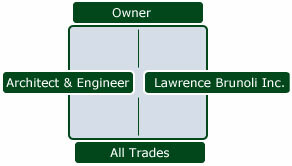 As the role of a construction manager, Lawrence Brunoli, Inc. provides a budget and schedules to help better inform the owner of project costs and time frames. We assist in the selection of the design team and contract interpretation. Upon the completion of the construction documents we will solicit and evaluate bids and select qualified general contractors or subcontractors that produce the most effective product to the owner while being the most cost efficient. Once the project begins, if required, we provide project supervision and coordinate scheduling of construction activities and subcontractors, accept or reject work in place, record and process necessary reports and site documents. As a Construction Manager, Lawrence Brunoli, Inc. provides our clients with a good service.